So we are down to the final four. They aren't necessarily the four we'd have picked at the start of the year. Many would have expected Mayo and Kerry to be in the mix somewhere, but over the course of the summer you can't say Dublin, Galway, Monaghan and Tyrone don't deserve to be involved at this stage of the championship. Galway take on Dublin tomorrow while Tyrone face Monaghan on Sunday. Here, I take a look at what we've learned about the All-Ireland semi-finalists and what the rest of the championship might hold for them. Galway are perhaps in the most interesting position of all four teams. Not to put too fine a point on it but I think they got it wrong last weekend in their game with Monaghan. Admittedly they were in a difficult spot, and one which no team had ever found themselves in before. They were playing an All-Ireland quarter-final that they didn't have to win. That was a hard line to walk. 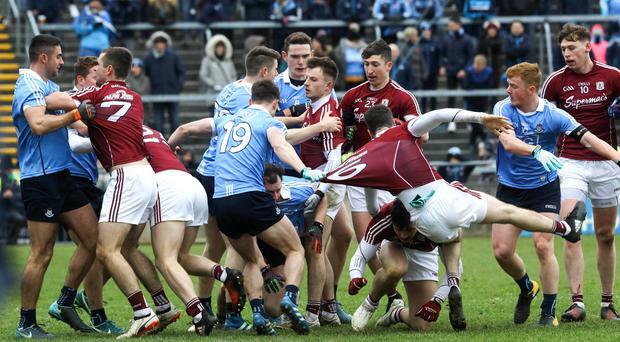 They didn't know whether to play the game full-blooded to win the thing and avoid Dublin in a semi-final or else make the bold move that would have seen Kevin Walsh run his bench against the Farney. In the end, Galway did neither and fell between two stools. Walsh could really have made a statement after their game against Kildare. As a group they could have come together and made a decision that the semi-final would be their sole focus and use the panel to fulfil the Monaghan fixture. You wouldn't necessarily be giving the game away. If your team won, well and good and you'd get a serious bump in confidence and you'd likely find a player or two would put their hand up for inclusion in an All-Ireland semi-final. You'd also have given some of your senior men a well-deserved rest. There was less to lose and more to gain by taking that approach. Instead, they tried to make it an important game even when deep in their souls the players knew it wasn't. And as such, Walsh's men went into the game in a state of flux. Sean Andy Ó Ceallaigh was one black card away from a suspension. What sort of mindset did he go into the game in? All they did in Pearse Stadium was lose a bit of crucial momentum and pick up an injury to Sean Kelly. Instead of having 20-odd days to prepare for Dublin, they gave themselves six. In many ways, Jim Gavin had the ideal build-up to a semi-final. With top spot in the group secured, they faced a dead-rubber in their final Super 8s encounter. Gavin's on-field generals like Brian Fenton and Ciaran Kilkenny weren't even named in the match-day panel. James McCarthy and Jack McCaffrey played a half each while Cormac Costello was in great form, showing the kind of damage he can do if Dublin get him the ball. Bernard Brogan was also back in action. This weekend might come too soon but he could be ready to play some part in a final if Dublin get there. Paul Flynn also showed that he could yet have a big say in the championship. Gavin has his side purring. So the Dubs are in pole position. Galway gave them plenty to think about in the league final and when they look back, they will feel they should have closed out that game against 14 men. Before last weekend they looked like they had the tools to trouble the Dubs. They are still capable but their confidence will have taken a dent. And you wonder if, after putting in such a high-octane season, are they running out of steam a little bit? To win this weekend, Galway need to get back to what brought them this far: an organised defence, controlled aggression in the tackle and big games from the likes of Shane Walsh, Damien Comer, Ian Burke and a fully-fit Michael Daly. It's set up for Dublin. Gavin has brought his side along at just the right time. The other three teams should have that little bit more desire and drive but credit to this Dublin team, they have never shown an ounce of complacency. Galway will need pretty much everything to go their way but for me, it's just too much to ask. Like Galway and Dublin, Monaghan and Tyrone have already met in a big game this year when they clashed in the Ulster Championship. I wrote before that game that it would go down to the wire but Tyrone's bench would get them over the line. I was only half right. It was close in the final 10 minutes but it was Monaghan who got the greater impact from their bench. Colin Walshe, Conor McCarthy and Owen Duffy made a huge difference to swing it their way. It's a result I think Tyrone can turn on its head on Sunday. Going through the stats of that day in Omagh, the teams produced very similar numbers on many fronts, with the exception of long kick-outs. Monaghan won the majority of Tyrone's long kick-outs (50m plus). They won the majority of Tyrone's restarts too and were getting scores off them. I just can't see that happening this time because Tyrone have improved in this area. That was evident against Dublin where they managed to put pressure on their kick-outs at certain times. And against Donegal, Shaun Patton was put under considerable pressure. At the other end, Tyrone were able to work scores off Niall Morgan's kick-outs. That's the single biggest area of improvement we have seen from Tyrone since they went through the back door and I don't see Monaghan getting the returns they did the first day out. I also think Tyrone's bench has come into its own. That first day in Omagh, there were injury concerns over Colm Cavanagh and Tiernan McCann while Mark Bradley and Lee Brennan went off. Cavanagh had his best game of the year against Donegal. McCann is getting there too and their form has a knock-on effect on what Tyrone can introduce late in the day. Against Donegal they pulled 2-5 from the bench while subs delivered 0-4 of their 0-14 against Dublin. While there's little to pick between the starting sides we'll see take to the field on Sunday, I think Mickey Harte has a significant edge in terms of his subs. The other big factor is where Monaghan are at psychologically. That win in Galway was a milestone for them and when you achieve something like that, it can be easy to switch off. Deep down, are they happy with that? They'll also know that they have beaten Tyrone in Ulster before, only to go out in the All-Ireland series when the action moved to Croke Park. I'm not sure Croker suits them. I know they beat Kildare at HQ on their last visit, as well as Dublin in the league in a dead-rubber, but I wonder if they have a mental block about playing in the place. They've had some serious disappointments there over the years. They've also had a difficulty backing up big performances. We saw that last year against Down and this year against Fermanagh. Only time will tell if Malachy O'Rourke and his men have figured that out. It will be tight, but this time Tyrone's bench will see them home. - Fermanagh said goodbye to a great servant in Ryan McCluskey during the week. I managed Ryan for two seasons, in one of which he was captain, and he was a great footballer and presence in the dressing-room. He gave 19 years to a county. That level of service is unlikely to be repeated. We'll never see his likes again. I just hope he uses his free time to practise his golf.